Earlier today I read a blog post by Chris Brogan, in which he discusses boring blogs. This was my biggest fear coming into the Blogathon 2012 challenge – to not have anything to say every day. Or even worse, for this blog to turn into a “what I did today” blog, of which I loathe to admit there are hints. Now that’s boring. Those are the five themes you will (mostly) see – with the occasional personal or gardening post thrown in for flavour. I will work on planning ahead too, so I’m not always straining for a topic at the end of the day. And if I’m really struggling, I’ll just keep it short. Plain and simple. And he’s even got a giant list of his “best advice about blogging.” I highly recommend. This entry was posted in reading & writing and tagged blogging, Chris Brogan on May 7, 2012 by Jessica Quinn. It seems I’ve accidentally committed to writing a blog post every day of May. And I’ve written about 10 in the last 29 years. You might wonder how this happened? I was likely either severely out of my mind from writing papers for my master’s degree (for which I have only just a week ago submitted the draft of my final paper, thank you, thank you) or slightly tipsy from the consumption of too much wine. Or both, which is most likely. So, welcome to Blogathon 2012. I say accidentally because it makes me laugh at myself. Like I’ve said, I’ve only just finished my papers for my master’s degree and here I am making another writing commitment. The last few months have had me crazed with stress, with too much reading, too much writing, too much revising, and the moment my major research paper is due, I apparently decide to take on more writing. Go figure. I do love writing though. I always have (and my writing past is something I’ll get into in a different post), but there are a few things you should know about me when it comes to writing… especially if you plan to follow me over the next month. I’ve always been good at it, but I’ve also always been scared of it. This may be why you haven’t seen much of it. 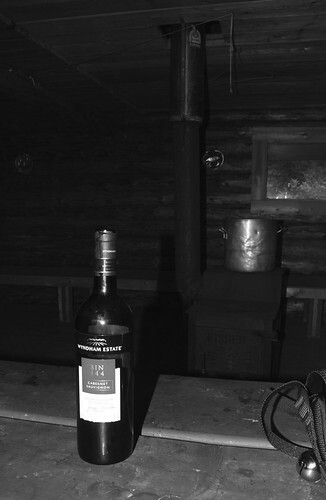 Creepy camping wine. My favorite. I do my best work when I’ve been drinking wine. Seriously. Even school work. I probably shouldn’t say this when I haven’t technically graduated yet, but much of my best paper writing has been done after a bottle of wine – and I’ve almost always gotten As. I’m a huge procrastinator (hence the pre-writing drinking). Again with the school work, I have often only started a paper the day before it’s due, and again, almost always gotten As. (I’m an over-achiever, but again, that’s a whole other post). So, as you could guess, you will likely only see my posts at the very end of each day…at the last minute. One of my biggest goals is to be a freelance writer for outdoorsy type magazines in general, and BC Magazine, in particular. Stay tuned on that one (even I don’t know what will happen there yet). I’m a huge grammar nerd. If you find a misplaced comma or an unintentional spelling mistake on my blog, I’ll be mortified. I hope that helps prepare you for this month! So, I raise my glass of cabernet merlot to this blog, this month and the rest of the Blogathon 2012 participants. Best of luck to all, welcome to my new readers and happy blogging! This entry was posted in reading & writing and tagged Blogathon 2012, blogging on May 1, 2012 by Jessica Quinn.